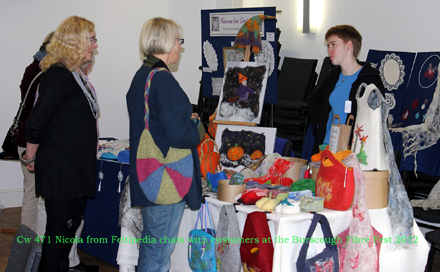 The first Burscough Fibre Fest last Sunday was a huge success. Thanks to Colin and Carol from The Wool Boat for all their hard work and excellent organisation. I saw Carol at about 8.30am and I have to be honest, she looked like she was going to have a little bit of a breakdown, at one point she shouted 'never again' but by 11.00am there was a huge smile on her face and I heard her say "yes, we're already planning next year......"
It was wonderful to meet spinners and knitters from all over the country, some who said that they have to spin alone because there are no groups for them to go to. If you spin alone, why not go to your nearest Knit'n'Natter? Knitters are always happy to meet spinners and usually will want to have a go at spinning on your wheel, before long you may have a few of you spinning together. 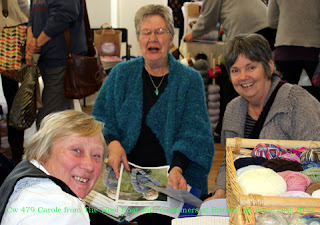 I'm happy to come and visit a Knit'n'Natter, send me a message or a comment and if you're near enough, I'll pop over. Joy and me spinning away. Joy, from the West Lancs Niddy Noddies brought along all manner of fibre, fleece and garments. 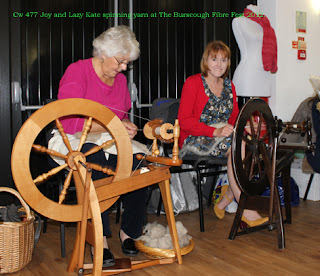 There were many people who were interested in fleece preparation and a few men who would like to learn to spin, more because of the mechanics of the wheel rather than a love of fibre. Who cares what your motivation is? Feltmaking was very popular too and Nic from Feltipedia brought along felted slippers and bootees, cobweb felt scarves, which are incredibly beautiful and pumpkins. Nic and I will be exhibiting together at the Winter Arts Market at St Georges Hall in Liverpool on 7th/8th December. We're also planning a childrens craft club so if it's something you could be interested in, please let us know and we can tailor things according to the childs age. So, all in all, a great day, looking forward to next year already.